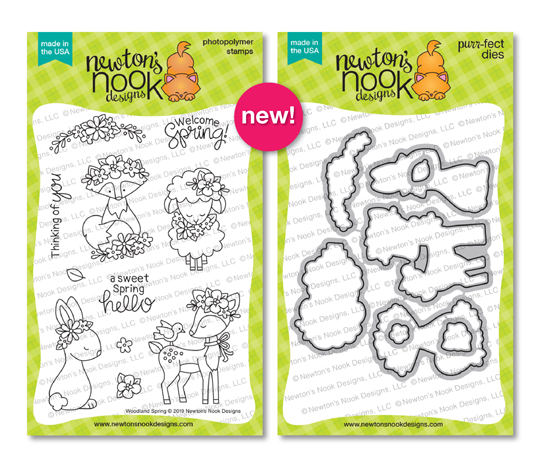 Hello and welcome to Day 1 of the Newton’s Nook Designs February release! Can’t wait to share with you all the new wonderful spring products! 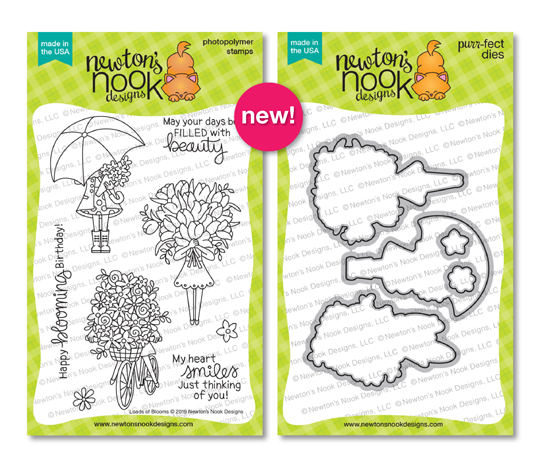 All the new February products will be available for purchase on Friday, February 15th at Newton’s Nook Designs online store and other craft retailers! What an amazing start of the week! 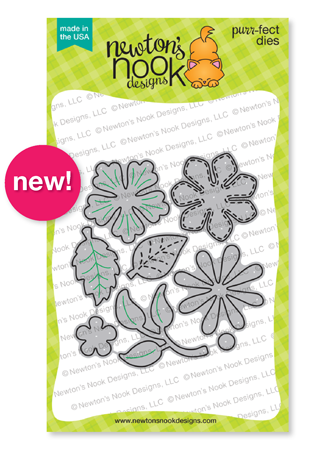 It’s time give first peeks on the NND new spring release! And so let me introduce you today Loads of Blooms stamp and the coordinating die sets, stand along Flower Trio Die Set plus two new fabulous stencils: Bold Blooms Stencil and Bokeh Stencil Set. Giveaway alert!! 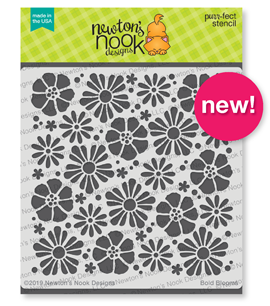 NND is giving new Loads of Blooms stamp sets away to a lucky winner so make sure you read all the way to the bottom of this post to see how to win! Here’s my example how you can combine these new goodies! To start, I used the coordinating Loads of Blooms die set and Strathmore Bristol paper. Next I stamped the outlines images from Loads of Blooms stamp set using VersaFine Onyx Black ink. And finally I could watercolor everything with Tombow markers. 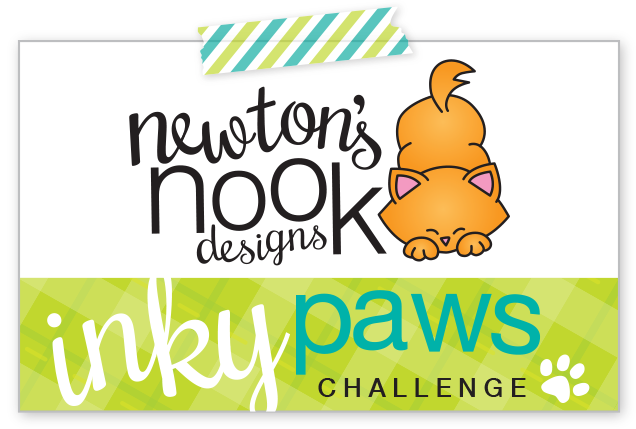 Here’re all the exact colors I used on this project: n.N45, n.025, n.026, n.055, n.133, n.177, n.636, n.665, n.772, n.850, n.947, n.990, n.991. The background was done with a wonderful new Bokeh Stencil Set. It’s another addition to the NND collection of stencil sets. 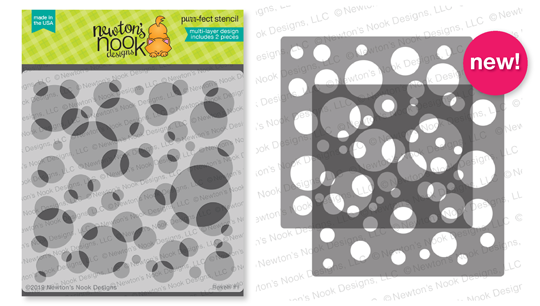 This set has two layers and allows you to create tons of amazing patterns in no time. On my project I used Spun Sugar and Tumbled Glass Distress inks and add a super light layer on a piece of the watercolored cardstock from Tim Holtz. Next I applied the first layer of Bokeh Stencil Set and inked once again the card front using the same colors of distress inks. For the second layer I switched to a plain white embossing paste. I really love how the pattern turned out and that a thin layer of the embossing paste shows through the colorful circle underneath. Finishing the card, I framed the bokeh pattern using Frames & Flags Die Set, heat embossed the sentiment from Loads of Blooms stamp set on a piece of a dark gray cardstock and applied a few embellishing accents. What a wonderful spring filled card! This card is so beautiful! I love the colors you used and the fun background too! Bloomin’ lovely!! Love how the soft background makes those vivid colors pop even more!! its so very pretty card! Very pretty card. Love the sky background. Your coloring is always wonderful. Nice job on the flowers!! Beautiful coloring and I love your background! A darling stamp set, a creative card! Simply gorgeous! Love all the colorful flowers!! And the bokeh background. Love that stencil! Sweet card! Love the image from this adorable Loads of Blooms set, and your Bokeh background is scrumptious! Awesome sentiment too! Lovely pretty cards! Thanks for the chance to win. Very sweet card. Love your choice of colors. Spring is definitely in the air with this bright and happy card you’ve shared, the coloring is lovely. Your card is so pretty, love it! Love the soft coloring of your background and the beautifully colored flowers! 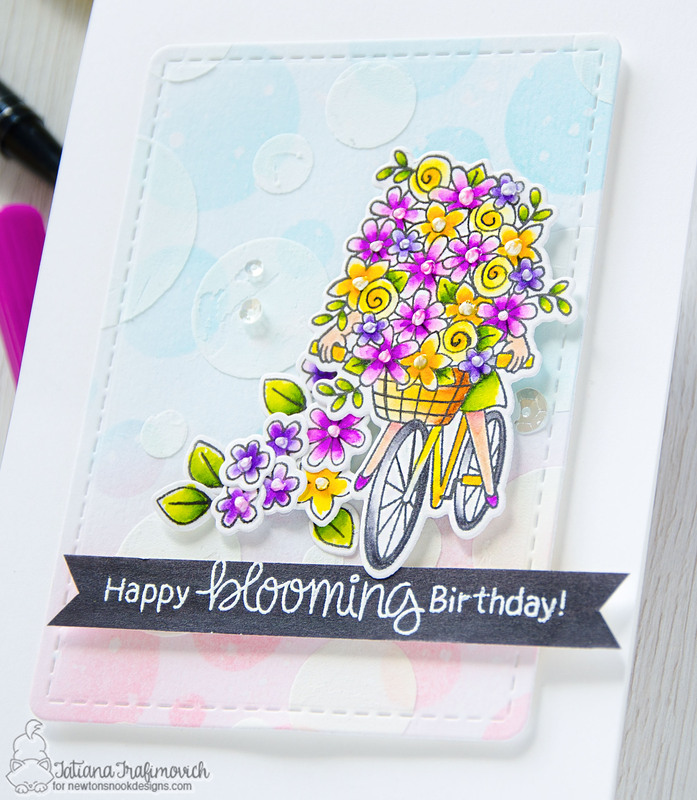 Love how you used the embossing paste on the background! It provides a lovely softness that you added to your card! Love the background for this bicycle filled with flowers. What a beautiful card. This is my favourite image from the set. Beautiful card! I love the background! 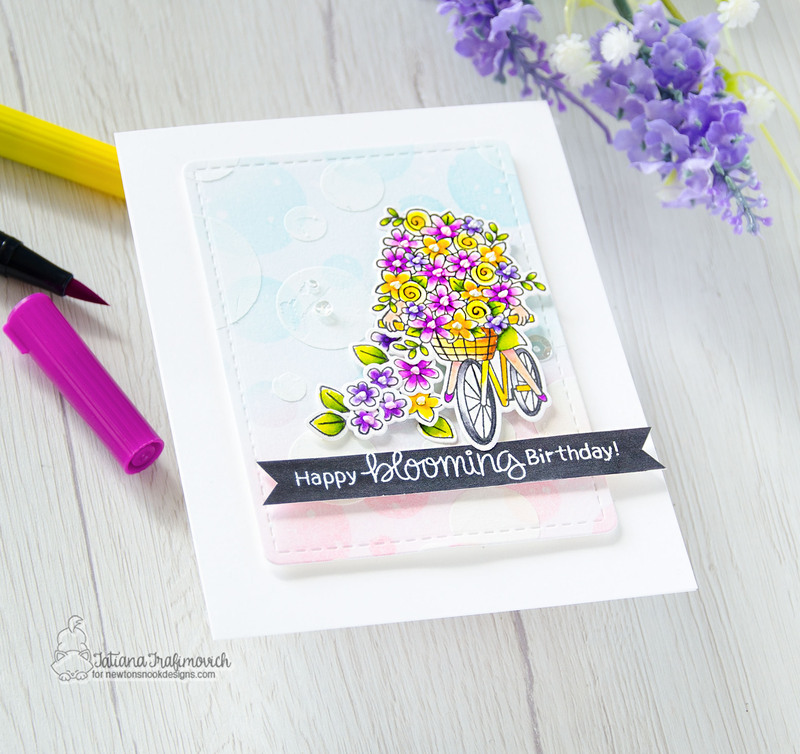 A really beautiful Spring card with such colorful flowers! So pretty and fresh! I really love the thin layer of embossing paste, & the subtle transition of pink to blue ❤ I'm so glad there is a continuation of the "hidden girls" – it is one of my favorite series!! Beautiful card, and really love that stencil. Well done! Nice card, I like your background. I really like all of the different textures and gradation you’ve accomplished in your card. It’s really lovely! Beautifully created card. Love that you used the bokeh in the background for your loads of blooms image. Beautifully colored and designed card. Wonderful card! 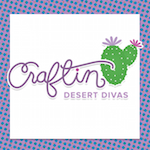 Thanks for ALL the cards you crafted for the FEB release blog hop! amazing!